If you are anything like me (and you probably wish that you were), it is possible that you caught a glimpse or two of Might & Magic: Clash of Heroes and assumed that it was, in some form, yet another "pieces falling from the sky" puzzle game. And who could blame us? At first glance it sure looks a like like another Tetris-inspired game, no? It's not what you think it is. Um... unless you think it is what it is, and then it is. While there is nothing wrong this style of game, the DS isn't exactly a stranger to it (Meteos, Tetris DS, Planet Puzzle League, Puzzle Quest: Challenge of the Warlords, Dr. Mario Express, etc.) It has even seen a hybrid platformer / puzzle game in the totally awesome and not at all broken Henry Hatsworth in the Puzzling Adventure. So it is understandable that, for those of us who thought this game was just another puzzle game, Might & Magic: Clash of Heroes fell under the radar. But I'm here to set a couple of things straight. A. Might & Magic: Clash of Heroes is not a puzzle game. At least, not in the way that it looks like it is. It's actually a turn-based strategy game, with puzzle elements. Call it a hybrid. B. 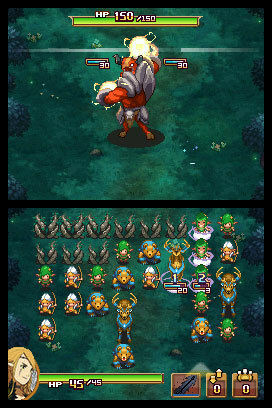 Might & Magic: Clash of Heroes is totally awesome, and one of the best games on the DS. So now that I got that out of the way, let's crack into what this confusing son of a gun actually is. 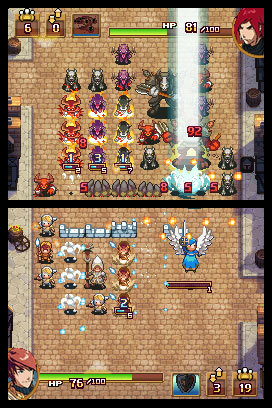 Basically, Might & Magic: Clash of Heroes is a turn-based strategy game fused with puzzle game elements. Throughout the course of the game you will take the role of five different heroes, each with their own variety of (themed) unit types, from soldiers to woodland creatures to the undead. These units take the form of either basic, advanced, or elite units. 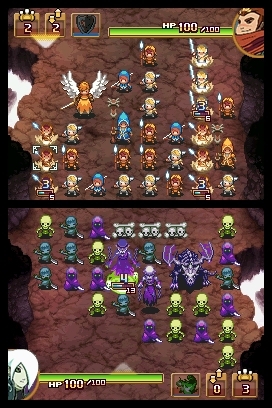 Every unit type in the game has its own unique attacks and special effects, many of which can work into your overall strategies, for instance, one unit type not only attacks an enemy but adds to their turn count. There are three types of basic units available for each hero, and you have an unlimited amount of these basic units to utilize for each battle (although you can only have a set amount on screen at any given time, of course.) Advanced and elite units tend to have attacks that are both more powerful and have better special effects, but both cost money to buy, and if one dies in a battle it must be replenished. Synthesizing your usage of basic, advanced, and elite units is key to success in Might & Magic: Clash of Heroes. Why do heroes always end up inside of volcanoes?! The worlds that you explore are laid out on a map with various paths that you can travel, and as you navigate the map you run into the usual suspects: NPCs, towns, caves, treasure chests, hidden paths, optional battles (either of the random or selected variety, often connected to an ongoing sidequest of being a bounty hunter), and of course, the core mandatory battles. Battles are set up head to head style where you take the role of a hero and control the units on the bottom screen while your opponent (computer AI) controls the units on the top screen. You have an 8x6 piece of real estate and a varying amount of units (depending on your hero's level) to work with. At the start of each match, your units file onto your screen in a random order. You have a limited amount of moves each turn to create either defensive walls (by lining up 3 or more of the same color of basic units horizontally) or attack formations (by lining up 3 of the same color basic units or the correct amount of basic + elite or champion units vertically.) You can also spend a turn to call in reinforcements, if you have any stored up. Once your turn is over, the enemy takes their turn, and vice versa. Each attack formation has a turn countdown that shows how many turns are left until they launch their attack, once they hit that point, BAM... off they go across the screen to take on the enemies in their way. But in most cases simply killing enemy units does nothing, hitting the back wall (which represents the main "hero" or "villain" HP) is how you take down your foe. In this respect, planning not just which units to turn into attack and defense formations, but where to utilize them, becomes a very key component of the strategy involved. Lining an attack formation directly against an enemy attack formation may help wear down their troop count, but lining one up against a gap in their defenses can make for a more direct route to the back wall and taking down your enemy's HP. The angels are pretty badass. Then again, when are angels not badass? The core battle system isn't too complex, but those willing to dig deeper will find a surprising amount of depth involved. For instance, if you can create formations of the same color that have the same amount of turns left before attacking, they will "link" together and gain bonus strength when they attack. The bonus is by no means insignificant, in fact, I will go so far as to say that successfully understanding and implementing the linking mechanic is key to surviving the tougher battles. You can also fuse units together by creating two of the same formation types in a row, and the resulting fused unit gains bonus strength as well. There is also a mechanic that gives you a bonus turn if a move of yours indirectly leads to the creation of a formation. If you learn to exploit this well, you can get a significantly higher amount of turns per battle than you would have otherwise, as well as manipulate the field to get key bonus turns at just the moment when you need them most. All of the above is probably more variety than I needed already, but the core battles only make up about 80% of the mandatory battles. The other 20% involve battles with unique objectives (destroying two switches at once, hitting enemies that move around the screen, defending a key spot for a set amount of turns, breaking heroes out of jail, etc.) and boss fights, each boss being a completely unique battle that requires completely different strategies than the core battles. 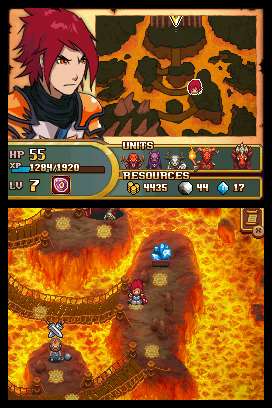 Might & Magic: Clash of Heroes is a long handheld game (20+ hours), and it definitely justifies that length by constantly mixing things up and keeping it interesting. Oh, and did I mention that Might & Magic: Clash of Heroes also lets you level up throughout the course of the game, equip different items with different effects (that range from starting the game with more turns to reviving once per battle with 25% of your total HP), and use magic during battles? Well, it does. Might & Magic: Clash of Heroes is also fairly nice looking and nice sounding. But I'm not going to waste a bunch of time talking about that, and you're probably not coming into a strategy game for the graphics and sounds anyway, are you? They're serviceable, and sometimes even great, but they're not the main draw of the game. The story is decent as well, and as it spans across five characters it has a bit of an epic feel, but again, it's not really the focus of the game either. What is this, some kind of a boss fight? This isn't to say that Might & Magic: Clash of Heroes is perfect. The design choice to switch between five different heroes throughout the game holds some pluses and minuses. On the plus side, it constantly changes things up, as each hero has his or her own unit set and, as mentioned above, each unit truly does feel unique, even the basic ones. On the minus side, every time that a new hero is introduced you begin at level one with only one unit type in your possession, and this can often feel like a huge step backwards from the battles you were just playing, both in difficulty and complexity, and it takes awhile to work your way back up. Another minus (admittedly not a huge one, but annoying nonetheless) is that you can't see the level of an enemy in an optional battle unless you choose to fight them, at which point you may find out that you just entered a battle with your level one hero against a level seven foe, or in other words, you're going to get railroaded. It'd be nice to know this information before accepting battles. It's also easy to make a move that you didn't intend to make if you forget exactly what button does what. This didn't happen to me a whole lot, but it did happen a few times, and once or twice it happened at a key moment. These are all minor gripes, however. At the end of the day, Might & Magic: Clash of Heroes is one of those rare games that surprised me by being significantly better than I expected it to be. It's one of the deepest and more unique games in the DS library (and this is a library full of strategy and puzzle games so that says a lot), and one of the best games on the platform, period. If you're still playing your DS, or waiting around for something to play on your 3DS, why not give Might & Magic: Clash of Heroes a shot? I don't have a 3DS yet, but I've been considering picking this up on XBLA since they remastered the whole game (hand-drawn characters, backgrounds, etc.). I already knew it was awesome, so yes I agree! @Paleo_Orca What are you stuck on? I got stuck at a few parts and worked out some pretty good strategies in the end. It's the boss in that chapter where she summons dragons, I keep trying different things, but I keep failing. I'm not sure what kind of strategy I should go with. @Paleo_Orca I was stuck there too... and got past it! Solution here. Ah, Okay, i'll try that later tonight. Very nice write up, the game looks excellent... thanks for the heads up! This game is so, so awesome. Perfect blend of puzzle, strategy and RPG. If you are a fan of these genres, you owe it to yourself to check this one out. Be it on DS, or the recent HD release on PSN/XBLA. Do it! Haha, awesome way to start a review! Looks fantastic. Too bad my DS backlog, and backlog in general, are morbidly obese. I just played through the demo I had downloaded. Fun! It was hard not to buy it on the spot, but I gotta stop these impulse purchases and start playing through some games. Probably a good idea to get through Link's Awakening, Donkey Kong and Majora's Mask first, ya know? I just tried the demo too and loved it! Funny aside, I went to d/l it and it was already on my hard drive. Guess I started the d/l when I was drinkin' and forgot it was on my system! Anyway, I was super impressed with the visual design, game mechanics, and overall feel. Demo was damn long too, clocking in around an hour. I'll likely be picking it up as soon as I clean up my pile a bit. Yeah, the game looks beautiful with the reworked designs and HD resolution. It has a similar look to Critter Crunch, another Capybara-developed game that I would recommend (PSN/iOS). Agreed. The visuals have that clean, animated look of Critter Crunch (likely my favorite PSN title on PS3). I'll have to pick this one up eventually... hopefully its one of those gems that can make its way to DSi store / eShop but I'm guessing this may be more of an asset filled cartridge than say Puzzle Fighter . Great write up. You mean Puzzle Quest. I downloaded that on DSiWare recently, and it's satisfying the itch that was scratched by M&M CoH for so long. The strategy is not as deep, but there is more RPG stuff. Have they fixed the various bugs for the DSiware version of Puzzle Quest, at least? It's my first time playing so I wasn't aware there were bugs? Great review, I may not have paid attention to this game or even known about it if it weren't for Zero! I'm typically not into the strategy genre (though I loves me my Fire Emblem games), but this game sounds really cool. I always find it interesting when a game is not just another 'typical' game in its genre. The DS seems well suited for these kinds of games. The game play sounds fairly deep and something I could see myself getting into. It's been a while since I touched it so I don't recall exactly what they were now, but there were certain types of attacks that actually didn't work. Also, something about the music... I can't recall! But pretty much every version of that game has tons of bugs.